Brewers won game 1 of the series 2-0, in a rain soaked game. There were two rain delays that totaled 2 hours and 13 minutes. Jimmy Nelson pitched six innings of shutout baseball, striking out 7 in the process. Jean Segura drove in Aramis Ramirez in the 5th inning. Then, after the rain delays, Ryan Braun drove in Carlos Gomez in the 8th. Francisco Rodriguez came in for his 11th save of the season. Taylor Jungmann had a perfect first inning in his Major League Debut. Jason Rogers hit a solo home run in the 2nd inning to give the Brewers an early 1-0 lead. Starling Marte hit a home run in the bottom of the 2nd to tie it up. The Brewers scored twice in the 7th inning as Ramirez drove in Braun on a ground out and Rogers drove in Carlos Gomez with a single. Ramirez hit a solo home run in the 9th and K-Rod earned his 12th save of the season. Jungmann picked up the win, pitching 7 innings, giving up 1 run on 3 hits and a walk, and struck out 5 as the Brewers won, 4-1. Gomez was out for game 3 due to sore groin. The Pirates struck first, going up 2-0. Braun came out in the 6th with dizziness. Hector Gomez went in to left field for his first work in the Major Leagues as an outfielder, and Shane Peterson moved from left to right. The 2 runs turned out to be the only ones scored as the Brewers failed to secure their first sweep of the season. They did win their last 2 series and 2 out of 3 on this road trip. The Brewers found themselves in a 5-1 deficit when they came up to bat in the home half of the 4th inning. They scored 2 runs in the 4th and tacked another one on in the 5th. Then Gerardo Parra tied the game in the 7th inning with his 4th home run of the season. Scooter Gennett hit a 2-out RBI single in the 8th in his first game back in the Big Leagues to secure a 6-5 win for the Brewers. Ramirez was the star of the show on Friday. He had 3 doubles and 5 RBIs by the 4th inning. Jonathan Lucroy added his own 2-run double in the 4th, knocking Jordan Zimmerman out of the game. 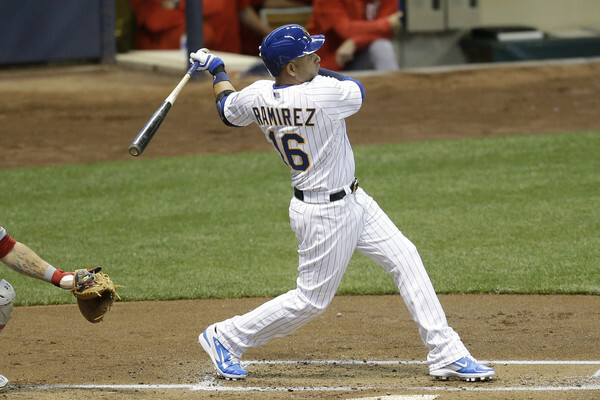 The bullpen gave up a run for the first time in 5 games, but the Brewers held on to win, 8-4. Nelson came off of his great appearance at the Pirates only to have a disappointing game against the Nationals. He was taken out with nobody out in the 6th inning after giving up 7 runs on 10 hits, 2 walks, and 2 hit batsmen. Carlos Gomez returned to the lineup after missing 3 games with a sore groin. Gennett continued his hot hitting since coming back up to the Brewers with 2 doubles and an RBI. It just wasn’t enough to overcome the Nationals early lead as the Crew lost 7-2. The Nationals’ Bryce Harper came out of the game after being hit by a pitch in the 9th inning. Sunday’s game was all about the Nationals’ Max Scherzer. Taylor Jungmann had another good start, giving up just 2 runs in 5 innings in his second Major League appearance. Unfortunately for the Brewers, Scherzer dominated on this afternoon. He pitched a complete game shutout while striking out 16 Brewers. Carlos Gomez got the only hit for the Brewers, a broken bat single to lead off the 7th, and Gennett drew a one out walk in the 8th inning for the only other base runner for the Brewers. Braun came out of the game on Wednesday due to dizziness. The medical staff found some fluid on his eardrum and treated it, and Braun did not miss any playing time. Will Smith was reinstated for Thursday’s game against the Nationals and picked up the win by pitching a scoreless 8th inning. Gennett was called back up and returned to action for the Brewers on Thursday. Gennett is hitting .357 (5-14) with a run scored and 8 RBIs in 4 games since coming back up. David Goforth was sent back down to make room for Gennett. Carlos Gomez missed 3 games due to a sore groin. He played in the final 2 games against the Nationals.